Coral reefs are a stunning part of many exotic places and can also be found in the waters off Massachusetts. 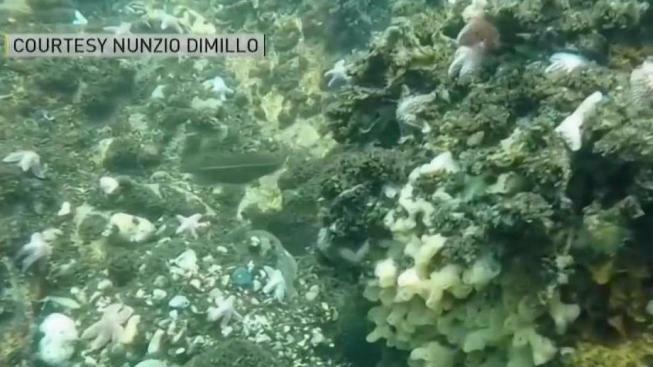 Diving into the waters off Woods Hole, Massachusetts reveals a surprise for some- coral. “We got them right here, right in front of the MBL,” associate researcher Loretta Roberson says inside the Marine Biological Laboratory, showing off coral samples she herself collected. “You have a tropical coral that’s able to live in freezing temperatures here,” she adds, saying she wants to know how the coral does it. She wants to figure out how this species lives so far north, in waters with huge temperature swings, while other types survive only in specific conditions. What she does know is that our New England coral survives under stress — what’s called a bleached state. But scientists don’t fully know why. By contrast, if more sensitive tropical corals stay bleached too long, they’ll die. That’s happening now in some tropical areas as oceans warm. “It’s the largest, massive global bleaching event that we’ve witnessed so far,” Roberson says while describing recent bleaching events. That’s a huge problem, with reefs acting as a buffer for the coastline, and a lifeline for ocean species. “Places like the Great Barrier Reef that hadn’t bleached in the past, now 50 percent of the reef is gone because of higher temperatures,” she says. Roberson also studies what gives the reef its shape, the coral’s skeleton. “The skeleton is what makes the reef, it’s the backbone of the reef,” she says. Roberson is working to understand how the coral makes the skeleton, and how things like changes in ocean temperature or acidity impact the process. All of this knowledge, hopefully enough to better protect this vital resource in a future changing world.